SUDAN’S new military rulers said they were ready for dialogue with demonstrators after hundreds of thousands of people defied a curfew to occupy central Khartoum for a sixth night. But the generals warned they would not tolerate “chaos” and ruled out extraditing Omar Bashir, the dictator they deposed in a coup, to face charges of war crimes. “We are not against the demands of the people, we are for the demands of the people, and we have to achieve them,” said Zein Abedeen, the general tasked with leading talks with the protesters. 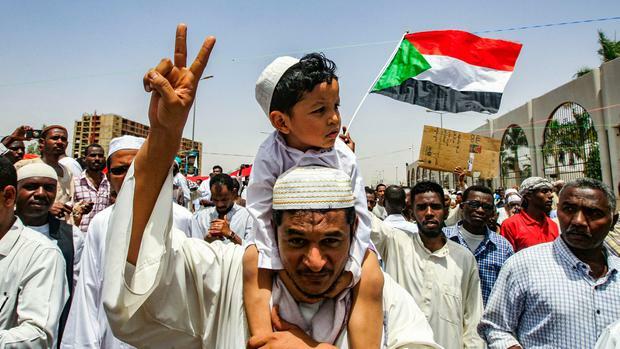 The Sudanese Professionals Association, which has led months of huge anti-government protests, said the “coup makers are not eligible” to oversee change and demanded an immediate hand-over to a civilian government. Their comments followed Sudan’s defence minister announcing he was stepping down as transitional leader. General Ibn Ouf said he took the decision to preserve the unity of the armed forces. Mr Bashir, who ruled Sudan for 30 years, was deposed on Thursday by his own military after clashes between security services and troops sympathetic to the protests. But leaders of the protest movement immediately rejected the announcement that a military transitional council would assume control of the country and impose a three-month state of emergency. Hundreds of thousands of demonstrators spent a sixth night on the streets outside army headquarters in Khartoum on Thursday and yesterday, in deliberate defiance of a 10pm curfew imposed by the military when they announced their coup. Protesters said there were no attempts by authorities to enforce the curfew. Several soldiers joined the protest, reinforcing claims by demonstrators that the junior and middle ranks of the army are reluctant to follow the orders of a top brass widely considered to be closely allied to Mr Bashir. In the morning, protests continued, with festive demonstrators shouting “down with military rule” and parading an enormous Sudanese flag.